This morning we participated in a press conference after the opening general session. On stage (l-r) are Dr. Mark Lyons, who is the son of company founder Dr. Pearse Lyons, next to him, then Alltech BioScience Medal of Excellence winner, Dr. Ronan Power and Dr. Karl Dawson, Alltech Director of Worldwide Research. For those of you who couldn’t be here to participate I thought I’d post the full press conference audio for you here. 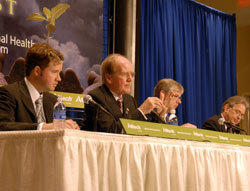 There were a lot of questions about how Alltech is accomplishing being “Green” and questions relating to how how they’re communicating their message to the public, their customers and to the regulators.